On December 29th, Mike & Stacy Healy will be featured guests on Faith Life Now‘s Television show. My Pastor has been an incredible influence in my life and I was very excited to have the privilege ofÂ recently being on his TV show along with my wife Stacy. If it wasn’t for my Church and his teaching, I don’t know where I would be right now. 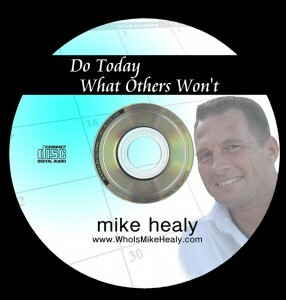 They are also releasing my new CD entitled “Do Today What Others Won’t”. I believe it will bless many people. In it I cover key points regarding life and business from a Biblical perspective. This CD will currently only be available through Faith Life Now Ministries. Faith Life Now is a weekly show designed to discuss relevant issues in the areas of faith, family and finances. Hosts Gary Keesee and Drenda Keesee, entrepreneurs, authors and speakers, share strategies for balanced, successful living. Finances are a strong focus because the Keesees believe it is essential to fix “the money thing” so you can get on with your destiny. Using humor, life application, personal stories and world events, Gary and Drenda bring a simple, fresh perspective on living life as a winner. Including insights on family relationships, practical money tips, principles from God’s Word and answers on how to balance it all, Faith Life Now is reaching everyday people with encouragement and freedom. Thanks and I know this show will bless you! Be the first to comment on "Mike Healy On Television"